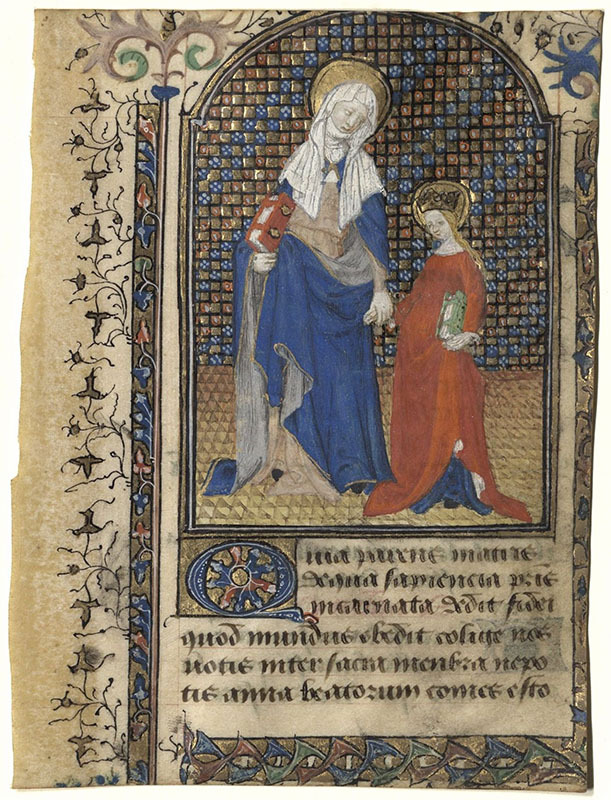 This leaf illuminated with an initial of St. Anne teaching the Virgin Mary to read contains the Suffrage of St. Anne from the Tarleton Book of Hours. Houghton acquired the leaf at auction as an example of the work of the Master of the Harvard Hannibal, named by the art historian Millard Meiss after the illuminator’s work on the large frontispiece miniature depicting the Coronation of Hannibal in volume II of Houghton Library’s MS Richardson 32, a medieval French translation of Livy. The Tarleton Hours was severely trimmed along its upper edge in an early rebinding. It remained in the Tarleton family from at least 1784 until 1951 when it was sold and dismembered; it originally included 35 miniatures. The acquisition of this and a second leaf from the Tarleton Hours, MS Lat 451, acquired at the same sale and depicting Christ before Pontius Pilate illustrating Lauds in the Hours of the Virgin, not only gives students an opportunity to examine at first hand the full range of the Master of the Harvard Hannibal’s work, both religious and secular, but also provides a basis for the experimental digital reconstruction of the manuscript, a topic of considerable current scholarly interest.